Today I have a real quick card I made to honor this week's featured stamper on SCS... Dara was the honored stamper this week and I have had the joy of meeting Dara in person a few times, and just had to play along. Here is her card that I cased. I used Layers of Color Butterfly Collector for my butterfly and colored it with Copics. For my background, I stamped the flourish from Nature Walk over the BasicGrey graph paper. The base of the card is a textured yellow from my stash, and I pierced the corners with the sun ray corner template by Ornare. I matted with Old Olive and added some ZVA Creative Pearls. You can't see it in the photo, but the butterfly is embossed with UTEE and popped up. Also you can't see in the photo but the ribbon is really a pretty double sided green on one side/ aqua on the other, which picks up the aqua in the butterfly. It is a super quick card but I had fun with it and it's nice to have one I can actually mail in a regular A2 envelope! LOL! Oohh... as a butterfly lover, I have to say this is just BEAUTIFUL! 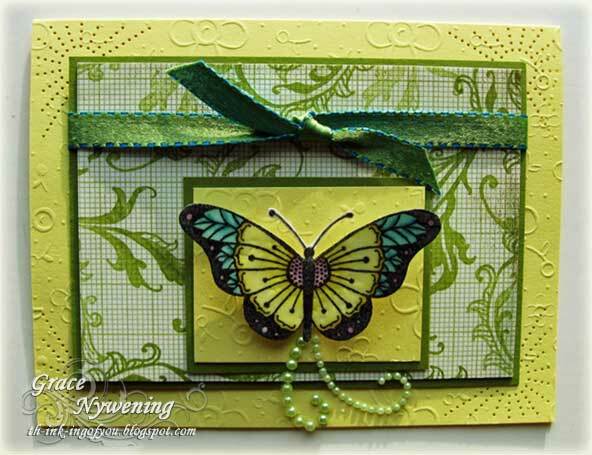 What a beautiful card, Love this butterfly. I love your card - it is a collection of wonderful details that all work so well together. My favorite detail is the pearl flight trail of the butterfly - it just makes me happy! Oh my Grace this is outstanding...LOVE the butterfly and this pretty color combo!!! Beautiful work girl!!! Stunning!!! The colors are beautiful. The piercing is fantastic! This is beautiful!! I love your colors and the great details on your card!! Ooo, marvelicious, Grace!! Creative and beautifully unique! Love the colors too! This is stunning Grace!! You should be so proud of it GF!! I love your colors and the stunning butterfly!! Simply beautiful dear friend!! Beautiful take on her card! The colors you used are stunning! Thank you for playing on my special day my dear friend. That meant a lot to me. Hope all is good with you.